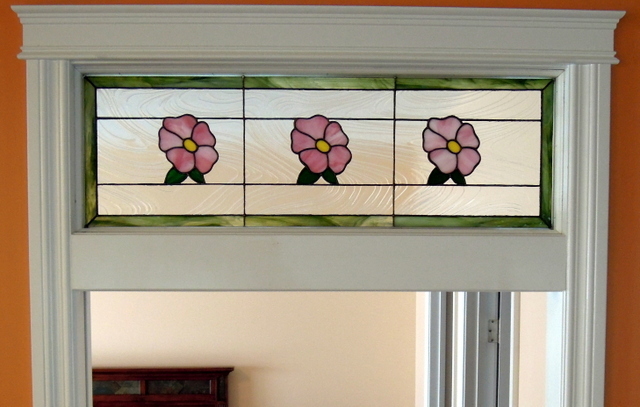 Once again we were given the opportunity to make an Alberta Rose interior transom window for a new duplex in Olds Alberta. The window measured 36 inches wide x 12 inches high. For the border we used Spectrum’s 6022.82CC Congo Pearl Opal and in the centre we were fortunate to obtain a full sheet of Spectrum’s 100B Clear Barnwood which we matched across the window. The first photo shows the completed window prior to installation in our clients new duplex. The next photo shows the transom window installed above the bedroom door way. We use the Morton Layout Block system when building windows to ensure a precise fit. This photo shows the layout blocks holding in place the 3/8 zinc came border, with the border glass fitted along with the Alberta Roses foiled and burnished. It is somewhat time consuming to fit and match the Barnwood glass, as all of the patterns are traced using white freezer paper that we obtain from Safeway, then glued on the smooth reversed side of the barnwood. There were five separate pattern pieces for each panel. We started on the left side and did each section ensuring that we cut and continued to match the barnwood glass across the whole window. The best advice we can offer anyone doing this is to take your time, measure and check numerous times before glueing your pattern to the glass and then scoring, breaking, grinding, fitting and foiling each piece. On each of the 3 panels we started at the bottom and worked our way to the top. When making a window like this using clear glass, where the solder lines will have black patina applied it is imperative that black backed foil be used. For cleaning we use Kwik Clean after soldering, again after the patina is applied and then apply Clarity Stained Glass polish, using soft cloths and toothbrushes to clean and polish the panel.